Even ten years ago, the middle of May signaled a bit of a break in the San Francisco dance season. There would be a few performances here and there but generally things wouldn’t fully ramp up again until October. But in 2018, Bay Area dance is year round and this past weekend was packed with shows – multiple SF events and a compelling East Bay engagement at the Osher Theater in Berkeley, a charming black box space that I had never visited before. 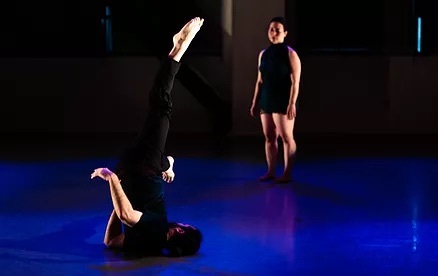 There, AHDANCO offered a mixed repertory bill of returning and premiere choreography by Founder and Artistic Director Abigail Hosein – a program that with abstract, conceptual and narratively driven work, showcased the company’s breadth and range. Aptly titled too short, the evening began with a brief premiere solo danced by Dana Lawton. Extremes abounded. Small movements were coupled with vastness; vibrating arm circles and fast footwork met large flying jumps and sustained body curves. Winsome transitional steps effortlessly linked these extremes together and Lawton’s clarity of shape, position and intention completely hypnotized. The abstract solo was indeed ‘too short’ and left this audience member yearning for more. Perhaps in addition to being a delightful amuse-bouche, the piece also offered a comment on today’s on-demand lifestyle. We could all use a little more scarcity. Rebecca Gilbert and Andrew Merrell in 2015’s Me and You was a highlight of the evening – a duet with a narrative arc, charting different points of a relationship, the highs, the lows and the space in between. The pair entered the stage holding hands. With tenderness and warmth, they began the first movements of the dance. Unison phrases reinforced connection; counterbalances showed them working as one to create poses and shapes. They collapsed together, sharing moments of pain and anguish. And then things started to shift. Still together on the stage, a distance started creeping into the scene. While Gilbert watched from the sidelines, Merrell danced an emotional solo, full of open arm gestures and upward facing palms, offering himself and his experience. She was there, but at the same time, not there. As the score shifted to a Bach composition, they once again began dancing together but the mood and atmosphere had been permanently altered. The earlier distance grew and increased, almost to the point of disengagement. Eye contact was avoided and even as they embraced, you could sense a chasm in between. Yet, underscoring this new reality also seemed an ardent desire to rekindle the connection of the past. Desperately, they tried to cling together, wrapping arms and legs around each other. But their attempts were unsuccessful, and as Me and You closed, there was a distinct sadness. It is a poignant piece - touching choreography and a very moving performance by Gilbert and Merrell. Then we came to the centerpiece of the program, the premiere of Event Horizon. Costumed in white, Merrell stood still as he systematically pulled a black scarf out of his shirt’s left pocket. The material pooled and piled at his feet, but he was not able to clear the scarf completely. As he reached its final length, it remained fused to his pocket. About a year ago at a Dance Up Close/East Bay event, I saw a preview/early iteration of this work, and so this mesmerizing first scene was familiar to me. Back then, the piece felt like a comment on the process of letting go – the purging of grief, sorrow and heartache. That sentiment was present here too, but I also felt like something else was happening. Over the next thirty minutes or so, the rest of the ensemble, dressed all in black, would enter and exit the stage, in various emotive vignettes (duets, quartets, solos, etc.). Sometimes they felt calculating and ominous, dancers swirling their hands as if to conjure a spell. Sometimes the movements seemed sad; sometimes there was even a glimpse of hope. As these configurations continued, I started to wonder if the dancers were representing the scarf and grief itself. That as much as Merrell was trying to rid himself of the grief at the beginning, so too was the grief trying to absent itself from him in the rest of the dance. Hosein has crafted a work that examines the multi-layered-ness of despair. It was a powerful shift in the narrative lens, one that I hadn’t expected.